Just 18 short months ago, almost no one — not politicians, not reporters, not lay people — used the term ‘fake news.’ Sure, bias and dishonesty have existed in politics, in sales, in industry and in media forever. What’s new since the viral spread of the ‘fake news’ concept, though, is our almost universal belief that fake news is around us everywhere, all the time. The result? Too many North Americans are willing to disregard facts as ‘fake’ if they don’t align with our personal perspectives. That’s bad news for agriculture unless farmers step up to the challenge of meeting fake news head-on. No industry is as regularly, as intensively, and often as personally attacked by agenda groups as farming. Depending on where you turn, farmers are painted as alternatively (and sometimes, simultaneously) concealing, poisoning, destroying, abusing, devastating. If the negative messaging makes you indignant, outraged or anxious, you’re hardly alone: farmers across the country and around the world report decreased overall contentment and increased stress associated with farming due to negative online attacks. Where farmers often go wrong is in directing their anger, frustration and stress towards the everyday consumers who are reporting less confidence in agriculture and the food system. Often, those consumers are simply expressing a need for information. They’re victims of the fake ag news, just like farmers. Luckily, there is a way to help get agriculture back down that creek. Farmers need to guide consumers through the fiction-masquerading-as-fact confusion. 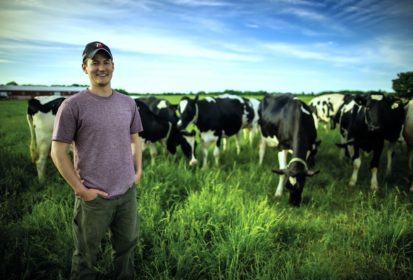 “At different junctures in agriculture we’ve had to add different features to our resumé. Now communication is one of those things we need to add,” says Campbell. It comes down to building authentic, trust-based, transparent relationships with consumers. Building relationships is about building trust. While that might happen most easily via social media for some farmers, it can also happen after church, during a golf game, or while sitting in the stands at your kid’s hockey game. Be proud to be a farmer, and be willing to share the facts that go along with your farm reality. Consumers want real information about the things they care about. If you aren’t willing to provide quality, timely, honest information, they will collect their information elsewhere. Consumers are not making up their fears. While the activists and sales people who have stoked the fears are motivated by money, the spark of concern existed before. Your marriage, friendships, and working relationships wouldn’t survive long if you put in just one session of conversation per month or year, no matter how great the conversation at that time. The same goes for building trust with the wider public. “We have to be factual. You can’t make stuff up. But, remember that simply stating and arguing that ‘this is how it shall be’ is never going to get us anywhere,” says Campbell. So, focus on building relationships and showing care. It’s a lot easier for someone to cross to your perspective if you’ve built bridges rather than walls between you. Campbell believes agriculture is coming around to the idea that communication is the single and only way to counter fake news. Many farmers used to ask him why he bothered trying to correct consumers’ food and farming misconceptions, advocate for agriculture, and invest in social media. Then, consumer pressure started to force changes that aren’t in either farmers’ or consumers’ best interests, like restaurant chains that started insisting on new production standards, and governments that started imposing new regulations. Now, more and more farmers are stepping into the ring alongside him. And, he says, those who aren’t yet willing to speak up for agriculture are no longer so critical of his and others’ ag-advocacy. “It’s coming. There is growing recognition that those who are participating in the conversation are doing it for good reasons and not wasting their time,” he says. What a difference a few years make, points out Campbell. Not so long ago, farmers worried that consumers didn’t care about food production and farming realities. Now, consumers clearly care. If we can shift that care into pro-ag advocacy, imagine what an industry we can build.